'Breathing' is an expansive topic relating to many things from, the manner in which, the quality of air we breath, hyperventilation due to anxiety, sleep apnea, deep breathing to reach altered states of consciousness, etc. Long ago I remember reading that early human did not breath as we do today. They breathed more deeply. If humans evolved from the sea, (aquatic god metaphors ... though evolution never happened that way ... in fact it never occurred at all. It was all abut programmed inserts - breathing goes to the evolution of human DNA. It's allergy time again! Achoo! If you've never had allergies before, 2006 might be the first time you will be affected by the endless airborne allergens, old and new, that manifest each year! 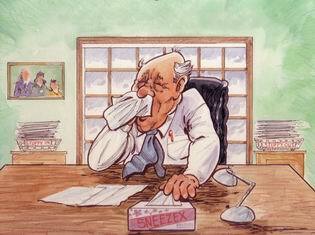 Allergies add to the stress many people deal with making it more difficult to function in the day to day world. Besides nasal congestion, most people experience watery eyes. Allergies often affect sleep when someone cannot breath while laying down and sinuses are blocked. Some allergies are mistaken for the flu or other illnesses. The inability to breath properly can created dizziness and migraines as all of the body's systems are interrelated. If you have allergies, you must determine the cause and see what can be done. Sometimes alternative remedies help. As you sit there ... slowly breath in and out through your nose. Are your nasal passages blocked? If so, you will not perform properly, whatever it is that you are doing.